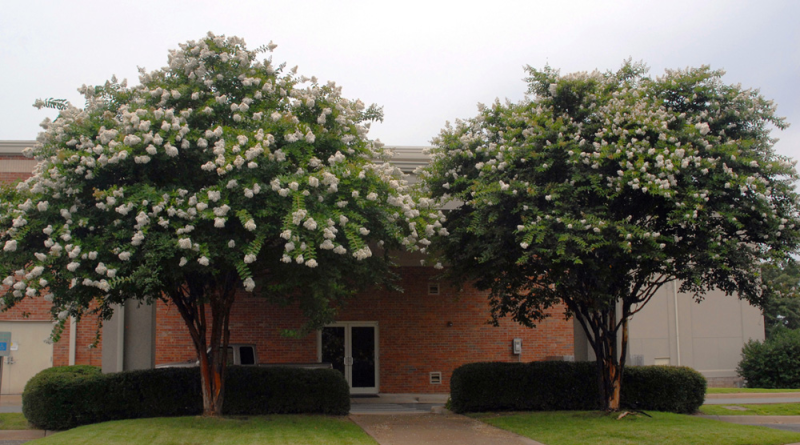 Two ‘Natchez’ crape myrtles demonstrate the potential impact of bark scale on the size and number of blooms in early summer. The tree on the left was treated seven weeks earlier with the insecticide dinotefuran, the one on the right was left untreated. Note the smaller blooms and mold-covered bark on the untreated tree. Click on the image for a closer view. Photo by Jim Robbins, U of Arkansas.